Our classic vacation package has standard tours included in the package, but, we are delighted to offer you additional experiencies and activities that will enhance your vacation and let you enjoy Tortuguero at its fullest. These optional tours can be arranged, booked and paid once you arrive at Mawamba Lodge. Optional tours will provide thrilling adventures, relaxing experiences, fishing outings and much more. What to bring: Comfortable walking shoes (flip flops and sandals are fine), fast drying cotton clothes, always have your rain gear available and if you'd like to buy some souvenirs, please bring some cash. Follow your guide and listen to his explanations about the flora of the rainforest. He will teach about some of the interesting samples in our gardens including (but not limiting to) Achiote plants, black pepper, star fruit, ornamental plants and much more. Your tour guide will lead the way to Mawamba Park and its two butterfly gardens and frog gardens. You will also have an opportunity to learn about some of our sustainable projects, when you visit our Bio digester, which takes care of all the sewage waters of the Lodge to convert them into a source of methane gas to heat up our stoves. What to bring: Comfortable walking shoes, sunblock, hat, comfortable clothing and camera. We recommend you always carry your raincoat as showers can happen anytime in the Rainforest. Tour cost: Guided visit included as part of your 3-day & 2 night program(and extended stays, approximately at 9:30 am on day 2. Unlimited self guided visits to all Mawamba Lodge guests. Depart from the Lodge by boat to the Ranger Station at Tortuguero National park for admission and Park fees. The Park Ranger will tell us which canal we are to explore today, and we will then venture on a 2 hour boat tour inside the canals. 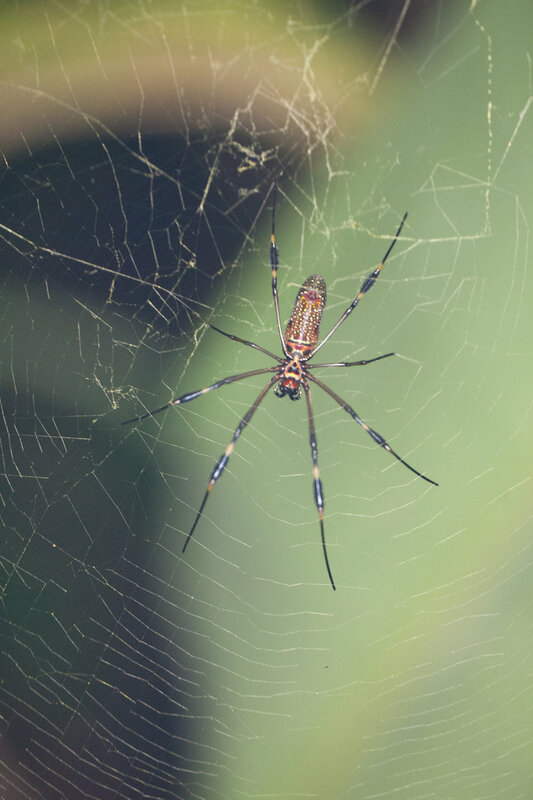 Flora and fauna in Tortuguero is amazing, with more than 350 bird species identified so far, including 3 out of the 4 species of monkeys of Costa Rica, caimans, crocodiles, toucans, sloth, and much more. Your tour guide will happily point out to the wildlife you discover. Keep your eyes open, as nature will arise right in front of your eyes. What to bring: Light jacket, poncho, sunblock, hat, comfortable clothing and shoes, binoculars and camera. We recommend you always carry your raincoat as showers can happen anytime in the Rainforest. Please don’t bring umbrellas as these obstruct visibility for other passengers on the boat (tour boats don’t have roof to maximize wildlife observation opportunities). This tour is included in our 2-day & 1 night tour and becomes an optional (extra cost) experience in all the other packages. Wake up early to enjoy the beauty of nature as a new day rises. Meet at the cafeteria for coffee (available since 5:30 am) to depart by boat to the Tortuguero National Park. From here, we will venture inside one of the Park’s backwater canals offering great opportunities for wildlife seeing. Take an opportunity along the ride, to close your eyes, clear your mind and inhale the refreshing sounds and feel of the Rainforest. As the day comes to an end, nocturnal animals and insects awaken. 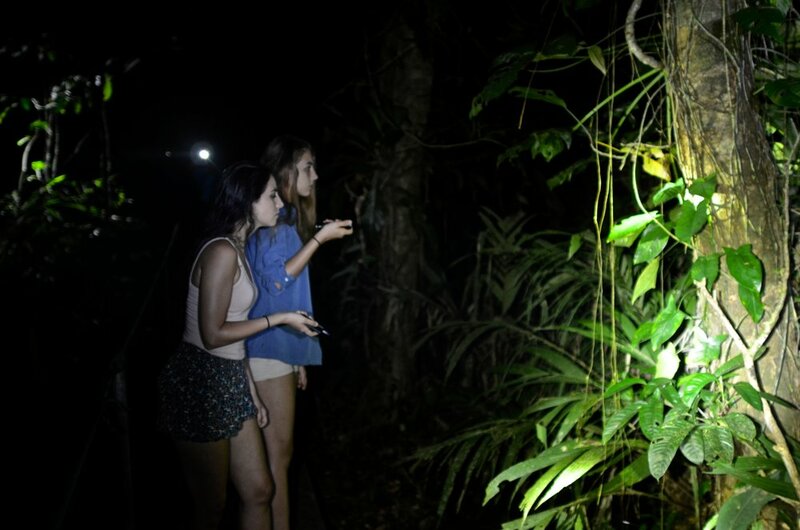 Our twilight tour is an opportunity to enjoy the sounds of the Rainforest at night, a completely different experience from your daytime outings. With the guidance of your expert naturalist guide we will leave Mawamba by boat around 5:30 pm to our private facility near the National Park and just 5 minutes away. Your 2 hour guided walking tour will take you on a loop inside the rainforest to discover the magic of the Rainforest as it turns dark. The trail has been carefully built raised from the ground and in cement, to allow your most comfortable walking experience. Return by boat to the Lodge just in time for dinner. What to bring: Closed comfortable walking shoes, insect repellant (we recommend you spray it on before departing) and don’t forget to bring your raincoat. A small flashlight is provided to lead your way (we don’t want to scare insects and animals away, just for you to feel comfortable walking in the darkness). 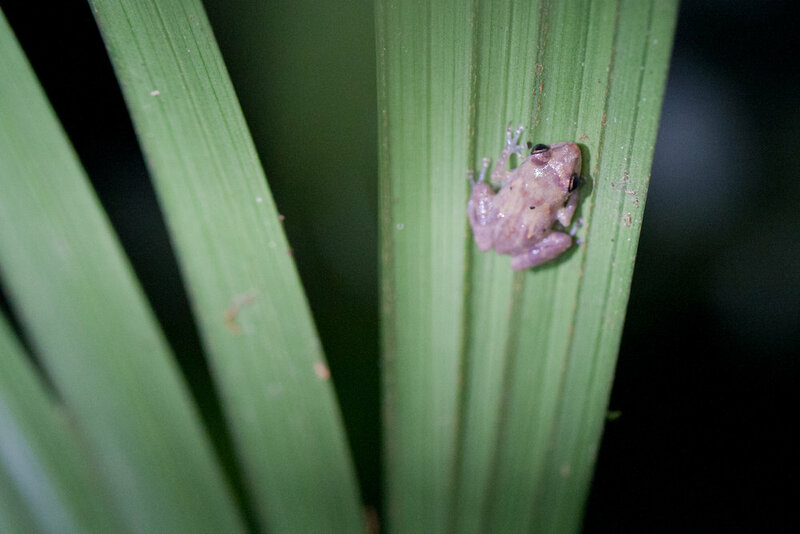 Discover the sounds and magic of the rainforest at night. Our kayak tours are designed to offer you a unique experience inside the National Park, while quietly paddling with your tour guide to discover the wildlife of Tortuguero National Park. Our Native Red Fish 10 kayaks (sit on top) are specially designed to navigate on the river. Tour departs from Mawamba Lodge by boat to the Ranger Station. We will stop for permit to enter and will continue to the drop off point where you will depart on your kayak adventure with your tour guide. Our captain and boat will remain there to provide assistance and return. Schedules: 6:00 am (wonderful to enjoy nature at its awakening time), 8:30 am or 2:30 pm. What to bring: bug repellent, swimsuit/swim trunks, T-shirt and shorts of a quick-drying material. A long sleeved shirt is useful if you want more sun protection. Water resistant sunscreen, sun hat or cap. We recommend you place camera or binoculars in drybag. Guided kayak boat tour in the canals. Tortuguero is one of the most important sites on the Western Hemisphere for the nesting of sea turtles. Four out of the seven sea turtle world species come to Tortuguero to nest. Moreover, 3 of these species are in high danger of extinction, so no scheduled tours are available. We offer nesting tours for the green sea turtles that come to nest between July and October. Turtles nest in the evening, to avoid predators. Guided nesting tours are available during this time and these are regulated by the National Park and conditions for participation apply. We invite you to read our Green Turtle Bulletin to learn more about the tour. What to bring: Black clothes (colors reflect on turtles, so they will return to the water if scared), closed shoes for comfortable walking on the beach (no flip flops or sandals), Long sleeved shirts preferable, odorless bug repellant and poncho/rain gear. No cameras or videos are allowed on the beach. A flashlight may be used only to light up the path to the station, once at the station, no flashlight will be allowed to use. Katonga is not a canoe, and definitely not a boat either. It is the new fun way to quietly navigate the Tortuguero Lagoon while enjoying a delicious lunch or dinner on board (Sunset tours also available). Katonga was carefully built to provide a fun, refreshing and relaxing way to cruise around the Lagoon. On board, it features restrooms and bar for soft drinks, beers and wine. Enjoy the beauty of the Caribbean sunset while touring the canals and sipping a beverage of your choice (wine, beer of soft drink). Enjoy the sunset views navigating the canals aboard Katonga. Our Katonga menu was carefully selected for you to enjoy a delicious meal served at your table, tasting specialties like local Ceviche (minced fish cooked over lime and herbs). The 2 hour boat tour allows for meal time and natural surrounding enjoyment. *Additional drinks available for purchase. Breakfast, lunch or dinner while navigating the Canals. Don’t pay anyone who offers to find a nest for you. This is a natural process an no one should disturb the turtles to find you a nest. Don’t touch the baby turtles. They need to feel and recognize the beach where they are born, as it is said that they will return to the same beach where they were born to nest (50 years later!). There are predators and we mustn’t interfere in the process. This is an activity you can do on your own, and there is no fee to do it. What to bring: flip flops or sandals to walk on the beach, odorless insect repellant, and comfortable clothes for walking on the beach. Tortugueros fresh waters are famous for fly fishing, specially for snook and tarpon. We will gladly arrange either a ½ day or a full day fishing tour for you with one of the experienced local boat men. Fresh water fishing in the canals. Mawamba doesn’t have a spa, but we can arrange for relaxing massages for you. Massage can be provided either in your room or at the beach area. 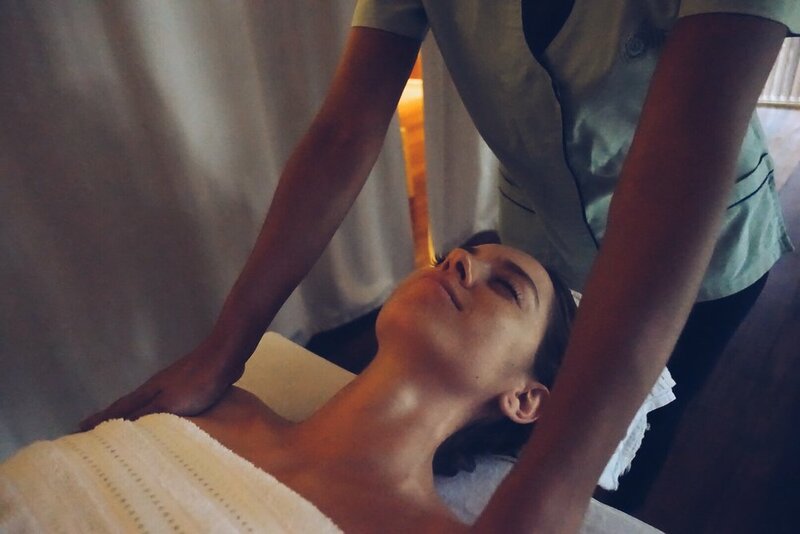 Let the expert hands of the masseuse transport you to a world of peace and tranquility. To start the trip, we will first go to the Tortuguero National Park ranger station by motor boat. Once the registration is done, you will board the canoe along with your guide for the 2 hour tour. This experience may be booked to leave at 5:30 a.m., 8:15 a.m. or 2:15 p.m.
What to bring: Insect repellant, cotton, fast dry t-shirt and shorts (Long sleeve shirts are very useful if you desire more sun protection). Water resistant sun block (SPF 15 or higher), hat/cap. We recommend that you place your camera and binoculars in a dry bag. Do not forget your raincoat.